So, what's the secret little Anderson panel all about anyway? 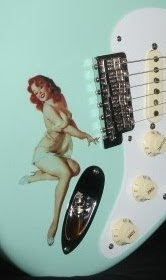 We've featured Mary Kaye models by Fender, G&L, even Suhr... and now here's an Anderson version. Besides the standard trans-white/blonde, pearly pickguard and gold hardware, this Anderson model is also a hollow/chambered body guitar. In fact, it's swamp ash on swamp ash! What's not to like about that! Light & resonant I'm sure. The listing at eBay includes all the specs including a sorta semi-whacky description that coulda been written by a guitar blogger or something.